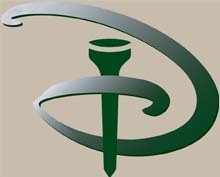 Disney has two very unique mini golf courses on property. Both are very different from the other. The first mini golf course to open on Disney grounds was Fantasia Gardens in 1996. Since then Winter Summerland has been added providing golfing fun for everyone. If you have any questions please feel free to e-mail us. Winter Summerland mini golf course is Disney's newest course. Here you can choose from two themes. You can go on the summer side or the winter side. Both sides provide 18 holes of golf. On the summer side you will experience the holidays in the warm tropical sun. You will find Santa in all kinds of funny places. For example on one of the holes you will find Santa buried underneath a pile of sand and Christmas ornaments hanging on palm trees. On the winter side you will experience snow and all the fun the North Pole does with Christmas carols playing in the background. Winter Summerland is a vacation retreat for Santa and his elves. No matter what side of the course you choose, you are going to have a blast. They both carry a great theme. And don't forget on hole 18 look for a special message from Santa. Fantasia Gardens is Disney's first mini golf course which opened in 1996. Fantasia Gardens is home to two 18 hole courses. You have the Disney fairways side and the Fantasia Gardens side. On the Disney Fairways side you will find it a bit more difficult due to the water traps, sand traps and so on. The look is much like a real golf course only miniature. This is a par 61 course. On the Fantasia Gardens side it is a bit easier and more fun for kids. For example you will see dancing hippos, broom sticks and buckets of water. This course is really fun with lots of neat sights. Fantasia Gardens mini golf course is sure to be lots of fun for the entire family. Typical play time is about an hour. You can find Fantasia Gardens located beside the Swan & Dolphin Resort on Epcot Resorts Blvd. To get to Fantasia Gardens by bus you must take the bus to the Swan & Dolphin resort. The course is located just across the street. Ask hotel staff if you have problems finding it. Winter Summerland is located near Blizzard Beach Water Park. To get to Winter Summerland either drive to Blizzard Beach or take a Disney bus to Blizzard Beach then just walk on over to the course. Hours are for both Winter Summerland and Fantasia Gardens. Hours are subject to change.